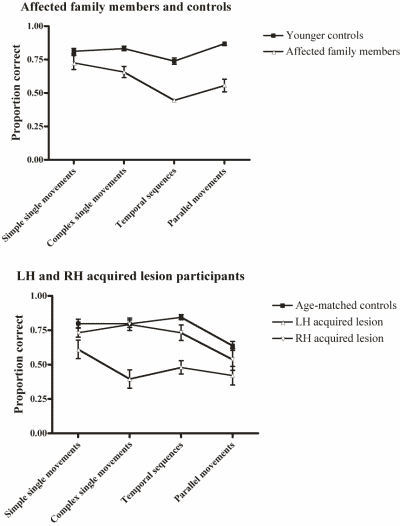 There has been little work to date on how oral motor control develops in children, and much of this has been concentrated on the feeding behavior of young infants or developmentally disabled children (a selection of recent work includes Fucile et al., 2005; Johnson & Harris, 2004; Mason et al., 2005; Rogers & Arvedson, 2005), with no investigation of any possible link to language development. 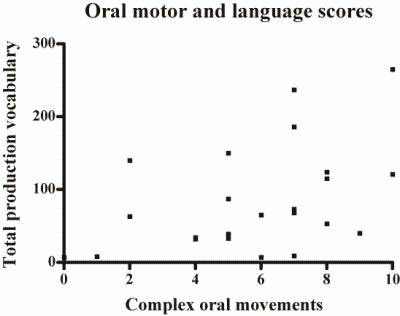 Some studies purporting to examine oral motor control and language focus on diadochokinesis, the ability to repeat speech syllables as fast as possible, which seems to stray from the definition of nonverbal oral motor skill, and which also has questionable value in diagnosis of oral praxis difficulties (Yaruss & Logan, 2002). What, then, do we know about associations between these two skills in typical development? There is in fact very little data on this link. Moore and Ruark (Moore & Ruark, 1996) used EMG recordings to examine the coordination of activity in feeding behavior and speech motor behavior, and suggested that these were not linked. However, the types of motor activity examined in the non-speech category in this study were mainly those involving a single set of muscles - opening and closing the mouth, chewing etc. - which were not found to be impaired in individuals with language impairments in Study 1. A small body of research finds immature oromotor function and immature speech processes difficult if not impossible to separate, even up to 10 years (Qvarnstrom et al., 1994). We set out to investigate this link further. If such a link is found at the time of the vocabulary burst, would it, as with associations with language disorders, be dependent on the difficulty of the movements used? Would there be any particular association with vocabulary, or with grammar? Would such a link merely be dependent on some level of general maturity, which might also be shown in gross motor development, or in cognitive development?